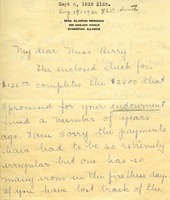 Mrs. Clinton Merrick writes to Miss Berry concerning the endowment fund Mrs. Merrick owed Miss Berry. 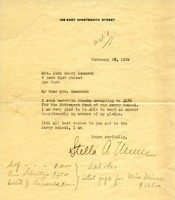 Mrs. Merrick enclosed a check within this letter and it was the last payment that was needed to fulfill the full payment for the fund. 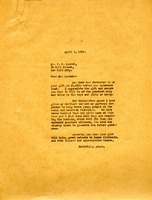 Emily Vanderbilt Hammond asks Berry to review an article Mrs. Hitchcock has written for Hammond's Berry Booklet. 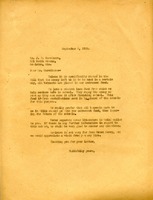 Hammond provides details about the recently organized Association of Berry Pilgrims, including publicity suggestions from Mr. John Leighton. Hammond hopes that Berry will be able to attend the annual meeting of the association, planned for November 15. 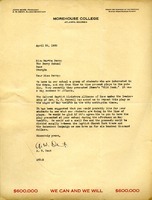 Martha Berry sends a thank you letter to an anonymous friend for the gift that they sent. Berry also discusses the daily struggles of running the schools and her hopes for an endowment fund to cover the costly expenses. 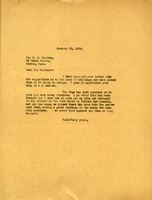 In this letter Martha Berry thanks Mr. B.M. 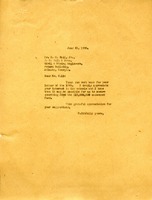 Hall Jr. for the letter on the 17th and asks for a donation to the $10,000,000 endowment fund. 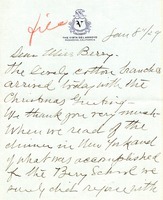 Martha writes to thank them for their gift to the Berry schools. She explains that she hopes there will be an Endowment Fund one day and that the schools have grown extremely fast. She also mentions that the school is expecting a great loss even if it rains in the near future. 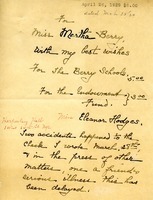 Martha writes to Mr. Lament thanking him for the gift that Mr. Ochs forwarded to the Berry Schools for the endowment fund. Miss Berry remembers meeting Mrs. S.A. McGeath when visiting with Dr. (Albert?) Shaw. She is appealing to Mrs. McGeath for additional funds that can be used for the Schools while maintaining the initial endowment. 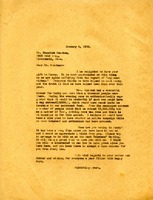 Martha Berry writes to Standish telling him that there was a wonderful dinner given by Mrs. Hammond with a thousand people. Someone enthusiastically suggested that everyone endow a day, which was then reported in the newspaper. Miss Berry notes that the newspaper seems to think there was a greater amount raised than there actually was. She explains that although people think they have raised a lot of money, they had actually raised less money than ever before. She also inquires as to when Mr. Meacham is going to visit again as it has been such a long time since he has visited. Miss Hodges sends $5 for the Berry Schools as well as $3 for the endowment fund. 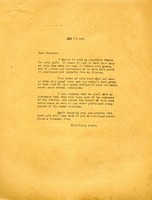 Miss Hodges was delayed in sending this letter until April. 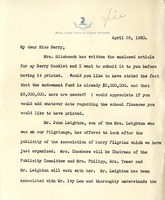 Miss Berry sends Mr. Carothers information on the endowment fund, the student loan fund, and literature on the schools. 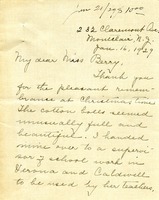 Miss Berry thanks Mr. Carlson for sending her suggestions on caring for the buildings. She also says that Mr. Hoge will send money the next day. She apologizes for the delay, saying that she has been so focused on what was happening in New York and that all the money has been poured into the endowment fund, leaving little for the running expenses.